fashion hacks. I’m not kidding. Shoes are some of the most complex pieces of equipment you can buy. There’s multiple materials ranging from foam to weird polyesters in a simple sneaker, and if you dig into shoes for biking, you’ll find some carbon fiber. All these layers are glued together, stitched, and assembled into a functional piece of exercise equipment, with multiple SKUs for each size. It’s really amazing. Accordingly, [marcs] created N+ Open Bike Shoe Platform, the purpose of which is to create open source, customizable, and repairable shoe platform based on 3D printing, though with other techniques like rubber molding and sewing fabric uppers are included as well. The project breaks down its signature shoe into all its various parts: heel, toe tread, insole, upper, and so on. With each part individually customizable, the shoe can be tailored to suit each individual, all while part of a cradle-to-grave lifecycle that allows shoe parts to be replaced, repaired, or recycled. Making beautiful things from epoxy and wood happens to be [Peter Brown’s] area of expertise. He was recently quested with reverse engineering the ring design of the Canadian manufacturer secret wood — a unique combination of splintered wood and epoxy — and achieved impressive results. While we’re not much for fashion hacks, we’re reasonably impressed with [Karolina]’s faux Chanel bag made of chips. Apparently a grid of black squares is one of Chanel’s trademark looks, and a thousand or so QFP chips makes for a reasonable substitution. News of the death of our retro edition has been greatly exaggerated. [Brandon] got an old Apple IIe up on the Internet and loaded up our retro edition, so we’re sort of obliged to mention him. He’s using a Super Serial Card connected to an OS X box running lynx. With getty running, he can shoot the output of lynx over to the Apple. Awesome. Take an old Yamaha organ, convert the keyboard to MIDI, throw in a few Arduinos, thousands of LEDs, and a handful of bubble machines. What you end up with is the bubble organ, as seen at the Bass Coast Festival last weekend. If you want a hands on, you can also check it out at the Rifflandia festival in BC, Canada this September. 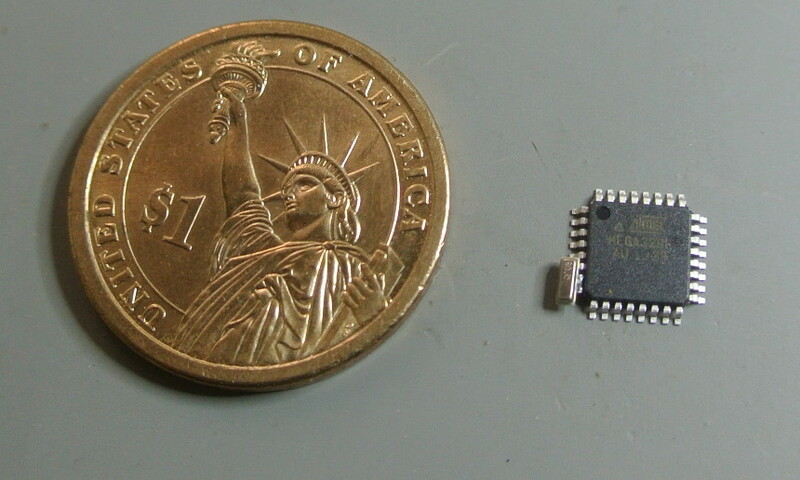 Some guy over on reddit created the smallest Arduino in the world. We’re looking at a rank amateur here, though. I’ve been working on this little guy for the last 18 months and have even created an open source cloud based github design for the production model. 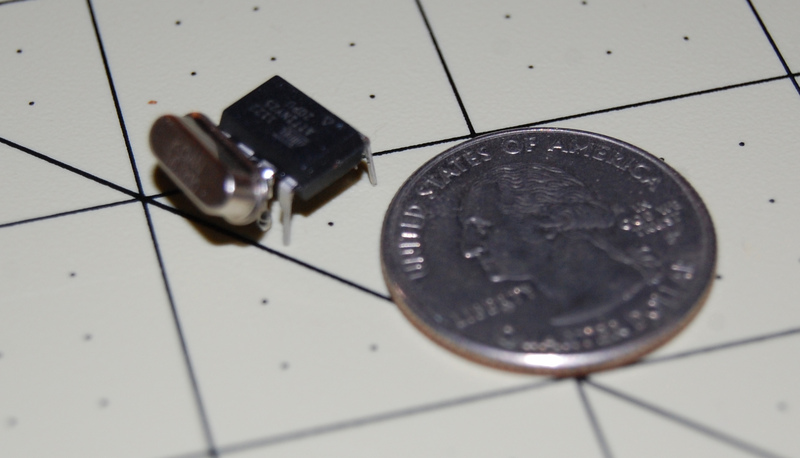 It’s less than half the size of a Digispark, and also Internet of Things 3D interactive education buzzword buzzword. [Moogle] found an old Super 8 camera at an estate sale. No big deal right? Well, this one is clear, and it uses light-sensitive film. Your guess is as good as ours on this one, but if you know what’s up, drop a note in the comments. One day [John] decided he would put a PC inside an old G3 iMac. After a year, it’s finally done. He took out the CRT and replaced it with a 15″ Dell monitor. The G3 was discarded for an AMD, and the internal speakers and slot-load CD drive still work. It’s a really, really cool piece of work.